Officials expect the death toll to rise inside the Ghost Ship warehouse that caught fire during a party in Oakland late Friday night, killing at least nine people. OAKLAND, Calif. -- Officials expect the death toll to rise inside a warehouse that caught fire during a party in Oakland late Friday night, killing at least ten people. More than 20 people are unaccounted for at this time. On Saturday night, the Alameda County Sheriff's Office said notifications will be given tonight to next of kin of the nine bodies confirmed dead. The fire broke out around 11:30 p.m. at 1305 31st Ave., a warehouse known as the "Ghost Ship" that was being used by an artist collective and hosted the party with musical acts Friday night. At least nine people have been confirmed dead, but Alameda County sheriff's Sgt. Ray Kelly said "we expect the death toll from this event to rise," with at least a couple dozen people unaccounted for. Nine bodies had been recovered from the scene by 4 p.m. and late Saturday night, ABC7 reporter Vic Lee witnessed officials removing a tenth body from the scene of the fire. Authorities will be using heavy equipment to breach the building at points other than the front entrance, which is blocked with debris, Kelly said. There was a pending investigation at the warehouse. A housing habitability complaint saying that there was illegal interior building structure. There were complaints filed over a year at the location for blight inside the warehouse. Earlier Saturday, Oakland Fire Chief Teresa Deloach Reed said there appeared to be only one makeshift stairwell made of wooden pallets leading from the first to second floor. The event taking place Friday night had a page on Facebook titled ""Golden Donna 100% Silk 2016 West Coast Tour" that attracted dozens of comments today from people trying to find out information about their loved ones who are still missing. A Family Assistance Center has been set up at 2425 E. 12th St. where family and friends can go to find out information about loved ones. People can also call the Alameda County coroner's bureau at (510) 382-3000 for more information. A hotline has been put in place for those who cannot locate loved ones. The property at 1305 31st Ave. is owned by Chor N. Ng and city records show complaints were made as recently as mid-November about the site. A notice of violation was given on Nov. 13 about "a ton of garbage piling up on the property," with "the main building remodel (sic) for residential," city records show. Oakland director of planning and building Darin Ranelletti said the building was only legally permitted for use as a warehouse and that Friday's party was not permitted by the city. Oakland Mayor Libby Schaaf said she spoke with some of the families of the victims. "It's painful to tell them that it will be a considerable amount of time before we can give them the closure they deserve," Schaaf said. Click here to donate and help the the families of the victims. The fund had raised about $50,000 out of its goal of $100,000 as of 4:30 p.m. The Oakland A's professional baseball team also created a fund for victims and said they are matching donations of up to $30,000. The fund at had received more than $22,000 as of late this afternoon. 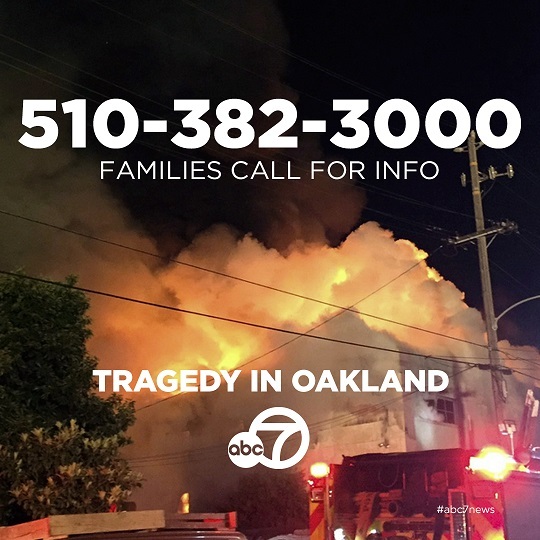 A vigil for people affected by the fire was held from 5 p.m. to 7 p.m. at the Chapel of the Chimes Oakland at 4499 Piedmont Ave.
Oakland police said they had to halt recovery efforts earlier in the day because the building was unsafe, but recovery efforts have resumed. Click here to find out if people in the area are safe. Click here to donate and help the the families of the victims.